This recipe comes from a book called Vinaigrettes by Michele Anna Jordan. I like that it is sweet and peppery all at once. I made it with White Balsamic vinegar. 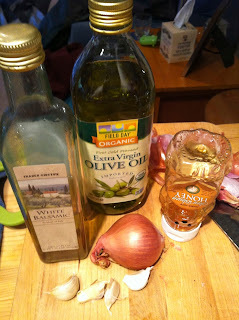 The shallot seems to stand up a lot, so I would recommend using 1/2 or a 1/4 of a shallot-depending on the size. The one that I used (in picture) was pretty overpowering. Makes about 1 and 1/4 cups. 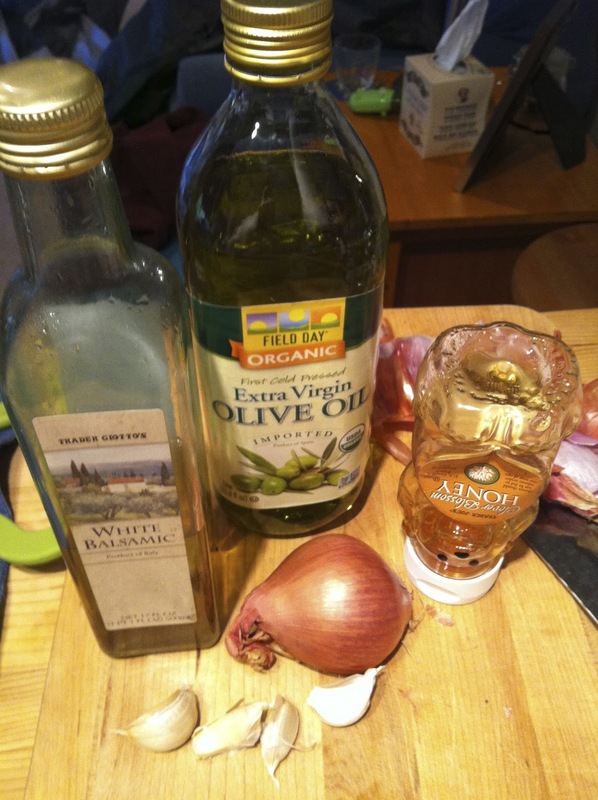 Put the shallot, garlic and salt in a small bowl with the vinegar. Let it sit for 15-30 minutes to mellow. Stir in black pepper, honey. I'm not sure you need to warm the honey, but it makes it helps increase viscosity. The author says that the dressing will last 2 days in the refrigerator, but I've had mine over a week and it's still delicious.